We do more than just sell fascinating fossils, rocks, and incredible minerals, we also buy gold! Come join us and see what all the fuss is about, send us a email at jimsfinecoins@comcast.net or give us a call at (630) 901-0083 we will be more than happy to answer any questions. 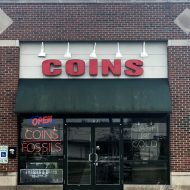 Jim's Fine Coins and Fossils, Blog at WordPress.com.